With the increase in the accessibility of good quality cameras in portable devices such as mobile phones, photography has gained immense interest and popularity among the people of various age groups and in all the countries around the world. But, having access to a professional camera is still an easy task and so is the art of Photoshop and photo editing. Hence, everyone is looking for a brilliant tool which is easy to use and is free for the consumers. 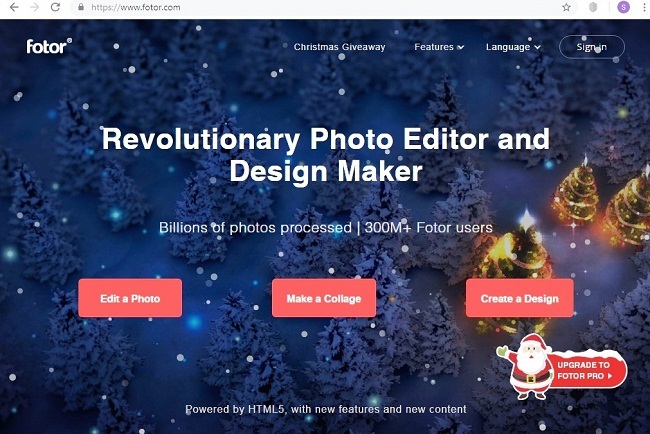 Fotor is one such tool, and in this article, we shall provide a detailed review of this image editor and graphic design tool. This is the first question that is asked by anyone who is introduced to this great tool. 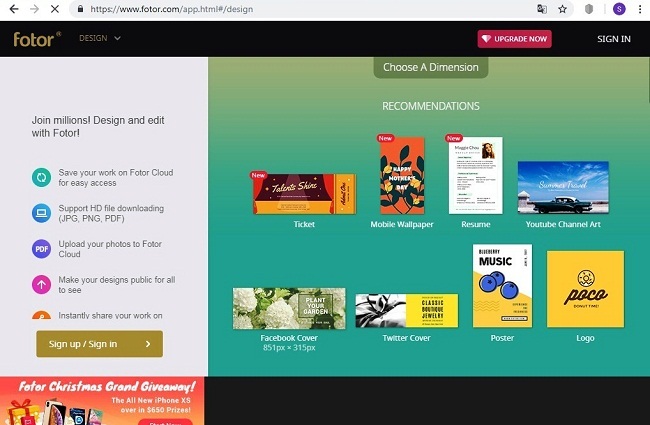 Fotor is an online image editor which lets you access its services for free, although it requires a sign in by its users before they can use the tool online. Fotor can be easily used by anyone to edit images, create collages, provide retouching to his pictures, etc. It is available on three platforms at present, that is, Windows, Android, and iOS. Like all other tools, this one also provides excellent access to useful yet straightforward editing features which are instrumental in editing pictures. You can change the dimensions, crop your image, rotate it as per your wish and also change the texture of the color distribution. All these features, including Text tool, work great and are up to the mark when a tool like Fotor is considered. Fotor comes with a wide range of features available to the users which include adding clip art to the images, adding frames, applying effects and also beautifying the image as per your requirement and convenience. The Templates feature an excellent feature of Fotor image editing tools which provide a whole lot of templates to use as per the time and occasion. 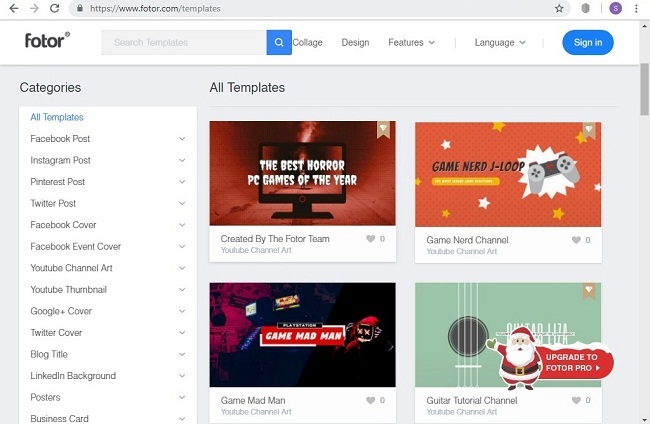 You can get templates for your Facebook posts, your Instagram posts, your youtube videos, and its thumbnails, for your cover photograph, etc. 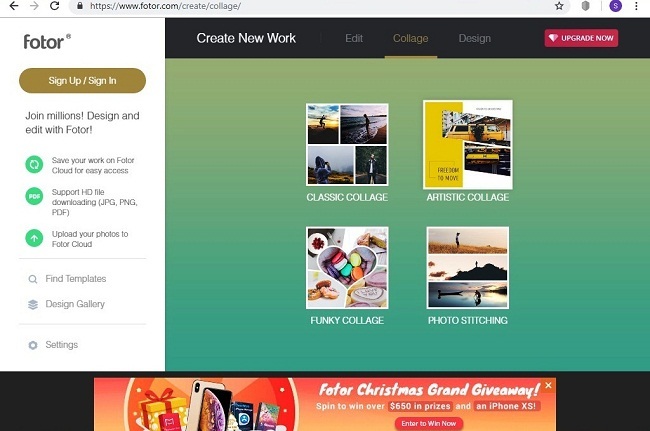 Additionally, for the professional people who intend to use the Fotor online tool, it has templates for business cards, LinkedIn profiles, blog cover photos, etc. Hence, this feature is up to the mark and is commendable. The Effects feature of fotor is yet another remarkable feature that is available to the users. You can choose from an extensive list of effects to use it on the images while editing them. Few of the results are AI Photo Effects, Lomo Effects, Cool Effects, Funky Effects and many more. The Tilt-Shift and Blur effect of fotor image editing tool works great, and it is a delight to use such results for free. The Banner maker is also an efficient tool of Fotor which is available to use for free. The banner sizes have already been predefined in the tool, and they are available for various purposes such as leader-board, cover photo, Facebook banner, Medium banner, rectangle shaped banner, etc. Also, you can create your banner by customizing option, which is indeed a nice feature of the website. The graphic design tool is also a remarkable feature that comes with the Fotor, image editor. You can easily design a Card or a Ticket as per your wish using this design tool. Also, a lot of pre-designed templates are also available to facilitate the design of posters, logos, etc. The dimensions of the design can also be changed as per the requirements, and that is an excellent feature of the website. The saved images can be stored in any format be jpg, jpeg, png, etc. Overall, this feature is unique and extremely user-friendly. The Fotor online tool is an excellent option for making a college and sharing old memories with everyone. There are a lot of pre-loaded collage formats available to use depending on the number of photos you wish to add to your college. Also, this tool allows you to import photos and resize the college easily, which makes the task happen real quick. The option of selecting a customized background is also commendable. The Fotor website is hugely, and all the features of the site can be accessed using just one click. Also, the website is available in a total of eight different languages such as English, French, Spanish, Russian, German, Chinese, Japanese, etc. There is a tutorial available for every main feature which makes it, even more, user-friendly. The website, as well as the app of Fotor, has a friendly User Interface which makes it one of the best recommended free image editing tools. Despite being a great image editing tool, Fotor too has a broad scope of improvement. While the response speed of these actions is very slow and it takes more than two seconds to see the changes in the image while editing, the feature of retouching needs some more insight and some more tutorials to understand how it works entirely. The same holds good for wrinkle remover tool as well. Apart from that, there are a lot of advertisements which cover essential areas of work screen and are a nuisance. This was the review of the online free image editing tool called Fotor. It is a useful tool for editing images and designing graphics, but there are many areas which still need improvement.